Our hot tub spa filters meets or exceeds manufacturer specifications. The Microfiber Disposable PreFilter takes out calcium, rust, sediments, and other undesirable elements from your water before you fill your spa. Good for up to 3 fills, the MicroFiber Filter meets FDA and NSF standards. Attaches to a garden hose. As you can see in this graphic, when looking at a filter's threads from the side the difference is very obvious. Standard, sometimes called "MPT" or "Male Pipe" threads are smaller and have a higher number of threads than the S.A.E. style. The S.A.E. threads are large and are square in nature almost resembling a child's toy. 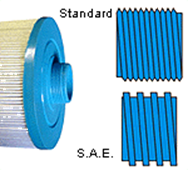 Spa Filter Baleen: AK-6473165, OEM: 6473-165, Pleatco: N/A , Unicel: N/A , Filbur: N/A, Diameter: 8-1/2", Length: 19"